These days, it seems you hear about Virtual Reality (VR) everywhere – at least I do. The HTC Vive and the Oculus Rift look cool and the idea sounds amazing, but you have to have a high-end PC in addition the headset. So unless you have a couple thousand extra dollars, they are just are too expensive for the casual gamer. What if you want to just try one for a couple hours? A friend recently told me about a local gaming store, Game Republik, that rents high end PCs, gaming consoles, and VR equipment, by the hour. 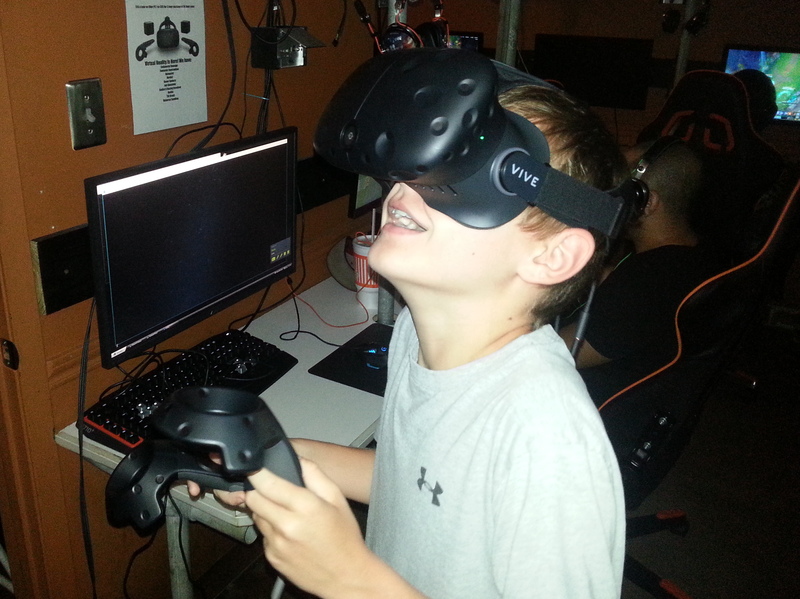 Now, for $10/hr, you can try the HTC Vive and the Oculus Rift and experience VR! We went to try it out and had a great time. They even have a great selection of games to try. I will warn you, the place is a bit of a dive – think the place in movies that the hackers always hang out at. It’s a small, windowless shop with random gaming chairs and yard-sale furniture. BUT, the equipment is first class and the shop employees are extremely nice and helpful. 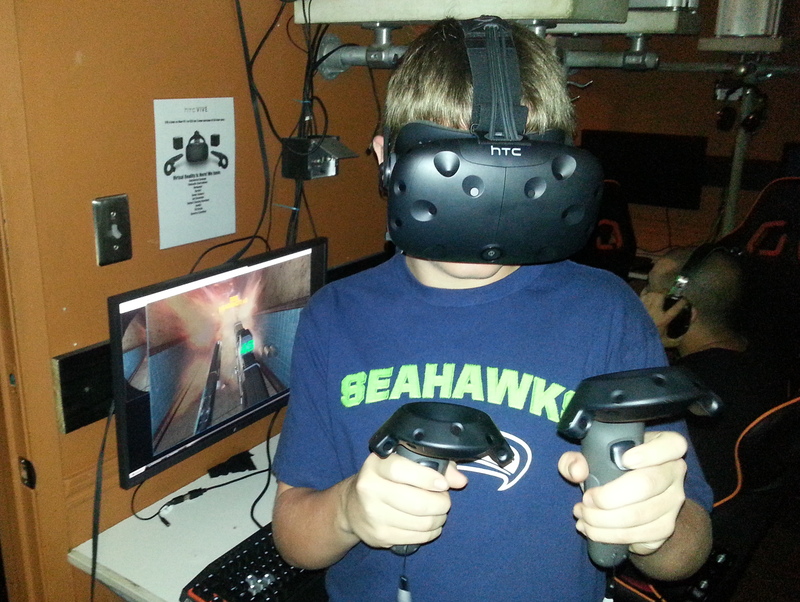 My boys took turns with the HTC Vive and a Playstation 4 and had tons of fun. Based on our experience, I’d recommend the HTC Vive over the Oculus. They both have good VR experience, but only the HTC Vive includes full motion capture (you play the Oculus seated and only use the mouse/keyboard). It’s similar to the idea of the Wii – you move the controllers around and it tracks you in the game. Wondering what the VR experience is like? Check out the video below for a general idea. We played more of those games and while some were a bit glitchy, we had so much fun. For more information on trying out Virtual Reality (VR) in Austin, including hours and rates, see Game Republik’s website. Pro Tip: Call ahead for reservations so you can make sure the VR headset you want is available when you show up. They only have one of each. Summary Interested in trying virtual reality in Austin? Game Republik now rents the HTC Vive and the Oculus Rift so you can try VR! 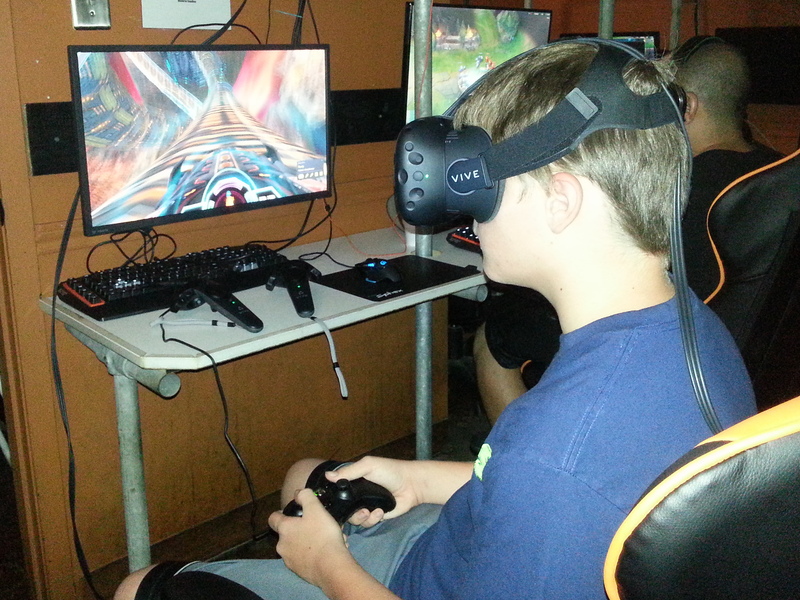 It's a bit of a dive, but totally worth it if you or your kids like video gaming at all. I would have marked the Parent's Fun rating higher, but they wouldn't let me play much, so I ended up watching most of the time. But for $10/hr, it's a deal.